The town of, Somerset West was founded way back in 1817 although its history dates back to 1657 when the Dutch first started visiting the area. 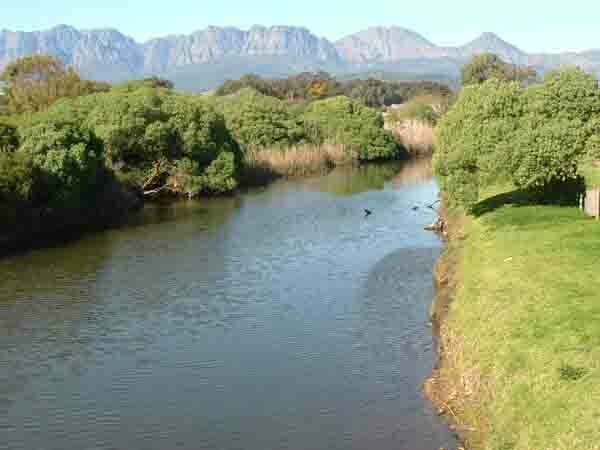 The Lourens River which runs through the town from its source in the Hottentots Holland Mountains was used as a source of water and its banks as grazing for the livestock of the Hottentot clans that lived in the area. The town grew up along the banks of the Lourens River. Somerset West has the best of everything, It is situated at the foot of the Helderberg ( Clear and bright) Mountains and overlooks False Bay. Between it and the sea you will find Gordon's Bay and the Strand towns today. Somerset West was officially named in 1820 after Lord Charles Somerset. It is situated in an amphitheatre with its northern arm extending to the Hottentots Holland mountains in the east. At the southern extremities of the town where the Strand and Somerset West meet the towns are divided by the N2 highway. This National road (N) runs from the centre of Cape Town along de Waal drive past the top end of Grootte Schuur Hospital (Hospital Bend) and then east towards the Hottentots Holland mountains. After travelling along the borders of Somerset West and the Strand the road winds its way up Sir Lowry's Pass and into the Overberg. Just before one crosses the top of the mountain into the Overberg there is a lookout point where one can look out over the Somerset West/ Strand/Gordon's Bay valley. The view is spectacular as one can see most of the False Bay Coastline , the mountains of the Southern Peninsula as far as Cape Point and even part of Table Mountain in the north. This particular spot has a special memory for me. I had just purchased a brand new motor vehicle and on a trip into the Overberg decided to stop and look at the view. In previous articles I have mentioned the south east wind that buffets the Cape during summer, well, on this particular day it was really pumping. My wife who was with me on the trip decided to get out of the car and forgot to hold the door as she got out. The wind grabbed it and ripped it off its hinges as she opened it. You don't want to know what was said, except to say that she was not popular for the rest of the trip. Sir Lowry's Pass is one of three roads to the east out of Cape Town. On long weekends and public holidays it is a real problem as apart from having a number of tight hairpins which cause many accidents, there are a number of traffic lights which slow the flow of traffic during peak periods resulting in major traffic jams as you try to get back to Cape Town. Somerset West has a number of other attractions as well. A wine estate named Vergelegen (lying far away) was established by Willem Adriaan van der Stel in 1700 and is still there today. It has a number of Cape Dutch houses which are beautifully kept and surrounded by beautiful English gardens with many oak trees. At the entrance to the estate are a number of Camphor trees which are in excess of 300 years old. Their stems are metres in diameter and the trees themselves have been declared National Monuments. The lovely gardens are used from time to time for Christmas Carol services and the symphony concerts. When this happens thousands of people descend on the estate and enjoy an evening picnic while the symphony orchestra does its thing. It's really a great evening out and events like these are well patronised. On the estate you can enjoy a meal at the Lady Phillips restaurant, or taste some of the Chardonnay or Sauvignon Blanc wines that the estate is famous for. The Grabouw (Overberg) Somerset West area is well known for its roses and the rose gardens on this estate are worth visiting. Close to this farm is the Helderberg Nature Reserve. This unknown conservation area is unlike any other in the Cape. It is home to a large variety of Fynbos species including the big King Proteas. There are a number of hiking trails that are well signposted in the Reserve and there is a choice between short half-hour walks for the not so energetic and a longer hike up to the Disa Gorge for the fitter and more adventurous folk. Either way fit or not, visit the area and experience the Cape Fynbos first hand. It's not necessarily the beauty of the Fynbos but the variety that captures one's attention. In Spring the colourful displays presented by the various species are something to delight in. What makes this area so special and a must on any visitor to Cape Town's itinarary are the amenities. Somerset West is presented as a premier holiday destination, It has a large shopping mall that has sixty outlets within its walls and plenty of parking for the visitor. For those who come on holiday to get sick there is a modern private hospital located in the centre of the town. Sportsmen can have a field day, and especially so the golfers, who have the famous Gary Player designed Erinvale Golf course to look forward to. As you may have noted from this article this is an area rich in history and deserves a place in any holiday itinerary when visiting Cape Town.